It's the 1950s in Verona, Indiana, and 15 year old baseball player Kurt faces off with resident bad-boy Angel. 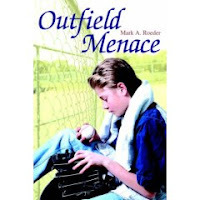 "Outfield Menace" is a work of passion that Mark published himself through iuniverse. It's the first book he suggests reading in his THE GAY YOUTH CHRONICLES series. Most of the novels in the series take place in small-town Verona, Indiana, over a few decades and some characters overlap from one book to another.